Our friends at the Royals Ticketing Office are at it again. 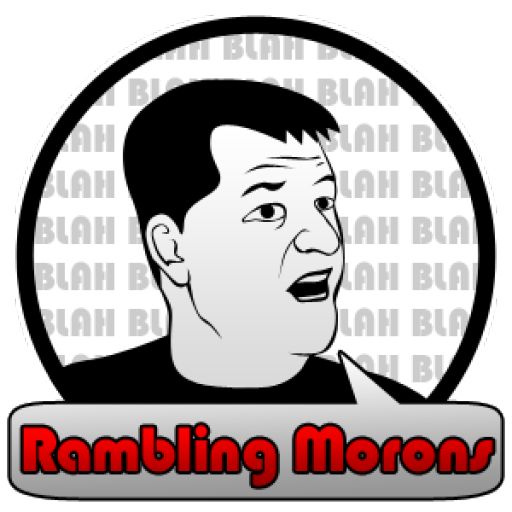 We’ve told you about this group’s attempts to outright fleece money from fans using questionable tactics, telemarketing and bait and switching – but now they’re resorting to just shaking fans down for money. Friday night, at least 20,000 Royals fans piled into Kauffman’s concourse to enjoy the first “Buck Night” of the year. The Royals were in first place and began to settle in to see a key match-up with the Cleveland Indians. A steady rain was falling and five minutes before gametime, the announcement was made that the game would not be able to be played as rain was expected to continue throughout the night. The game would be made up on Sunday as part of a split double-header. All things that, unfortunately, happen in baseball. Here’s where it gets strange. Since the team began in 1969, the ticket policy has always been to honor any rain out as a “rain check” – that means you can turn in your ticket for any other ticket for any other game that season (assuming it’s a similarly priced ticket.) No, your parking isn’t refunded, but that’s the way it’s been. Only, that’s not what the Royals did this year. 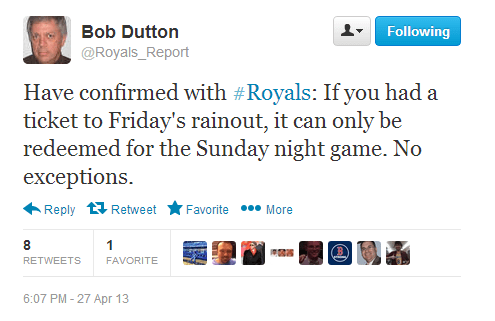 The back of your ticket now directs you to go to Royals.com and seek out the Rainout Policy. This policy now states that your ticket is good for that GAME only. That game, is being made up Sunday at 7:00. Your ticket is now no longer a “rain check” good for any other game. 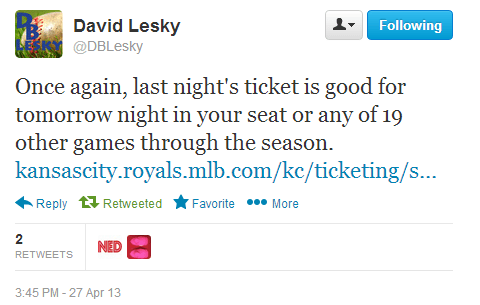 To further confuse things, respected Royals reporters on Twitter were also hearing confusion from the Ticket office. Other folks tweeted me and said simply getting ahold of the right person out there got them other more favorable ticket offerings. Listen, there’s been a ton of improvements to the Royals product on the field. The team is in first place and fans, understandably, are interested in coming out to see the Boys in Blue. But this ticketing office continues to confuse – at best – and outright steal – at worst. The Royals have always been a regional team – heralding fans from seven midwest states. People make a weekend out of it and generally hit Royals games on Friday or Saturday; Worlds of Fun on Saturday and then other sights around town on Sunday. This nonsense has everything to do with the Royals trying to fleece their fans out of every dollar they can. While we might’ve gotten upgrades at pitcher and in the standings, there seems to be no upgrade available when it comes to the folks that make decisions about your tickets. My advice to anyone who cannot go out to tonight’s 7:00 game is call the ticket office and don’t accept no for an answer. You’ll eventually find the right people out there who will help you. Don’t ask for more than you need and they’ll take care of you. 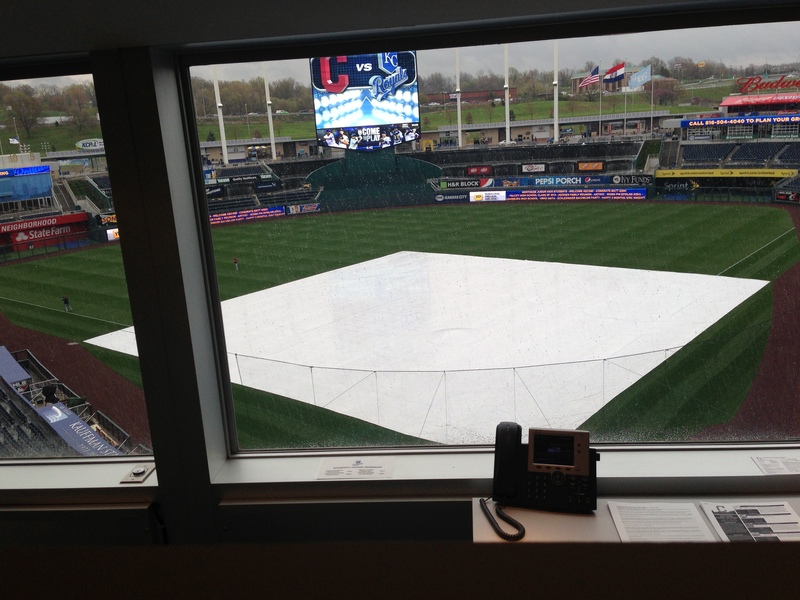 And for the Royals management, here’s an idea, make your product easier to go see. It’s not that hard. UPDATE: The Royals announced through the Kansas City Star, that they would honor tickets from Friday’s game for the rest of the homestand which stretches through May 5. 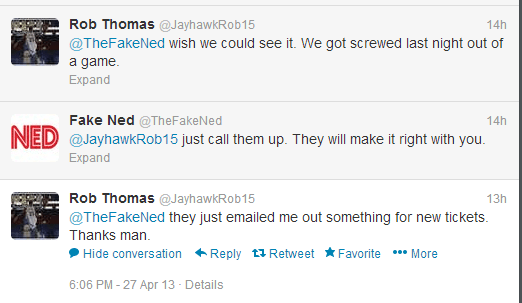 UPDATE 2: Now the Royals are saying that they will “make arrangements” with fans on a case-by-case basis.